The hydrazine-burning SuperDraco engines are mounted around the base of the 12-foot-diameter spacecraft in pairs. The four engine pods would be used to propel astronauts away from a failing rocket during liftoff. The thrust level of the SuperDracos during the hover test was about one-quarter the power generated by the engines during a launch abort. If Crew Dragon missions encounter no problems on launch, the fuel in the SuperDraco tanks could be used to slow down the capsule to precision touchdowns at designated landing zones on the ground. That is a stretch goal for SpaceX, which initially plans to recover its piloted Dragon spaceships after they descend under four parachutes to the ocean, splashing down in a similar manner to the cargo version of Dragon. Engineers will certify the Crew Dragon for propulsive landings later. NASA awarded SpaceX and Boeing contracts in 2014 worth up to $6.8 billion to ferry astronauts to and from the International Space Station. 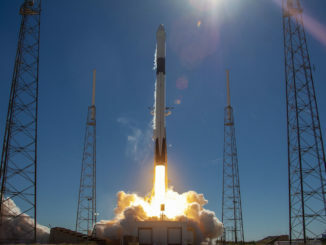 SpaceX’s Crew Dragon will blast off from Kennedy Space Center’s launch pad 39A atop a Falcon 9 rocket, deliver four astronauts to the space station, then return home after up to 210 days in orbit. The Nov. 24 firing in Central Texas was part of a milestone outlined in SpaceX’s contract with NASA. A brief test of the SuperDraco thrusters two days earlier verified the performance of the engines, while the second test demonstrated the capsule’s controllability with the engines firing, according to SpaceX. 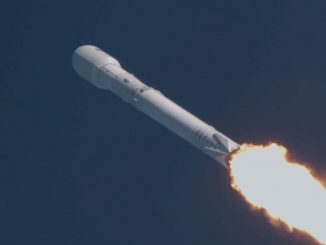 SpaceX refurbished the prototype spaceship flown in May 2015 on a demonstration of the Crew Dragon’s pad abort capability for the propulsive landing hover test. Later this year, SpaceX engineers plan to test the Crew Dragon’s parachutes, make progress assembling the first three human-rated spaceships for test flights and operational missions, and qualify the ship’s life support systems and spacesuits. 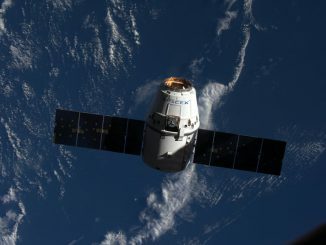 By the end of 2016, SpaceX aims to fly an uncrewed Crew Dragon capsule on a demo flight to the space station. Engineers will reuse that capsule for an in-flight abort test in early 2017. SpaceX targets the first Crew Dragon test flight with two astronauts in March 2017.